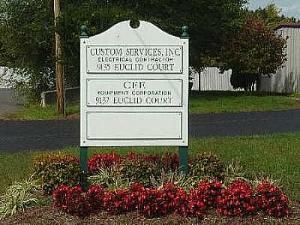 Custom Service was incorporated into the Commonwealth of Virginia in June of 1973. Sharon Hill became President and owner in January 2008 when the founders of the company retired. As a family owned and operated company for over thirty years, Custom Service, Inc. is one of the area's leaders in electrical construction. Our company provides electrical contracting services throughout the Northern Virginia area. As a commercial and industrial electrical contractor for new construction and renovation projects, we specialize in the installation of all facets of electrical systems and are a class "A" electrical contractor in the state of Virginia. Custom Service, Inc resides in more than a 7,000 square foot office building and is equipped with all tools, vehicles, and equipment necessary to accomplish all aspects of electrical construction such as installation of underground distribution systems, site lighting systems, normal and emergency power distribution systems, interior lighting and control systems, and special systems to include life safety, security, sound and telecommunications. Our business has performed as a subcontractor, in addition to offering design/build services on projects for more than three decades. We pride ourselves on offering high quality personal service to head off any unnecessary cost run overs and are always looking for ways to value engineer projects to save owners money. Our jobs primarily consist of commercial work within the public sector, including public education facilities, federal and state level government jobs and other businesses, as well as range to our original roots of residential service work for new and existing customers. Custom Service has an excellent track record of high quality work for customer satisfaction and has offered all the necessary services to provide a successful completion of many projects throughout this area. Our success is due largely to our very skilled and experienced work force. We are a strong believer in all apprentices attending a four year apprenticeship school and having broadbase experience and training in all aspects of electrical installation. Custom Service is committed to creating a safe and healthy work environment for our employees who are OSHA-10 certified along with First Aid and CPR training. As a family owned and operated company we consider each employee to be one of the family and a valuable asset. For more information on our team follow the link below.